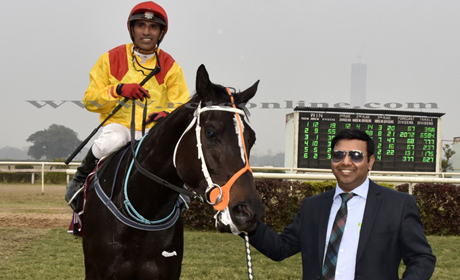 Trainer Vijay Singh`s colt, Shivansh (Suraj Narredu-up) displayed his amazing superiority over a gruelling trip of 2,800m to win the prestigious Queen Elizabeth Cup, on Saturday. 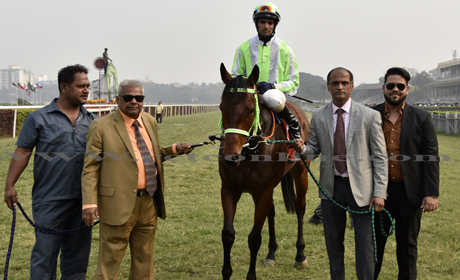 The Top Class-Immortal son had an easy measure of formidable opposition and he staked a strong claim for the nomination of the Stayers` Cup, in Hyderabad, early next month. 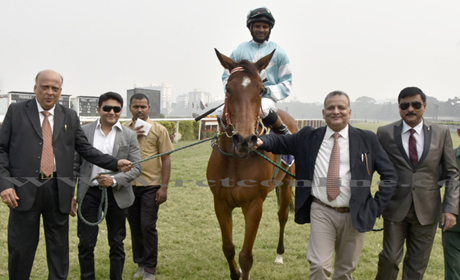 The afternoon also witnessed, Vijay`s baby, Jaivant (Suraj) working her way another victory by claiming the 1,600m Calcutta Million, having already won the 1,400m Champagne Stakes. The seven-event card also provided thrilling finishes, keeping the large magnitude at the edge of their seats. On the records, the trainer Arjun Mangalore`s 7/4 favourite, Point To Prove, was the only public-choice who just about managed to score while the strongly fancied runners like The Kiss and Multitude missed the targets, albeit in camera finishes. Shivansh was simply brilliant and the 11-4 fancied runner was spotted as a winner at the top of the home-stretch, the moment Suraj took over the running from the Bharath Singh-trained Midnight Phantom (Robbie Downey), who had shot ahead of the longtime leader, Kambaku (C. Alford), also from Mangalorker`s stable. 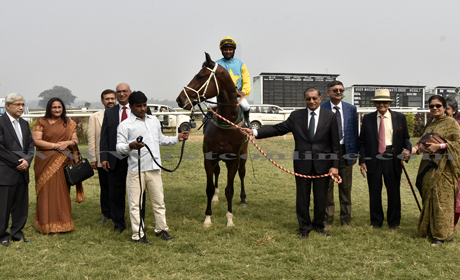 Shivansh, had displayed his penchant for the staying trips winning the 2,000m Monsoon Derby from the South India invader, Peluche. The Million was expected to be a close contest between the Jaivant and Bharath`s Eastern Crown (Downey), in view of the latter`s impressive second in the Champagne after covering much ground in the home straight. However, nothing of that sort happened in the Million. Jaivant went about his task in a business-like manner while Downey was seen struggling, almost in the rear, right from the word go. More importantly, the expanding odds on Eastern Crown also made it clear that all was no right with Knight Tour-Second City colt. 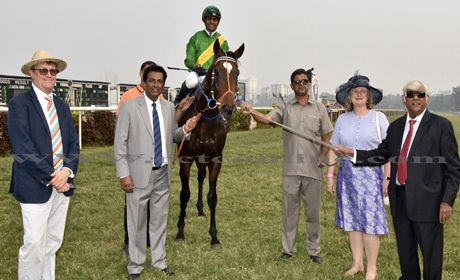 Equally pathetic was the performance of Bharath`s other runner, Castlebridge, also ridden by Downey, in the 1,200m The Metropolitan, a Class I race, which was claimed by Shyam Habbu`s Southpaw (S.Zervan). In fact, something was amiss in the performance of the Vijay-trained Multitude (Sandesh), who went to the start as a joint 5/2 joint-favourite with the winner. A hesitant Sandesh, took his own sweet time to issue the challenge to the ultimate winner, and lost the race by half-a-length. Sandesh also rode trainer Javed Khan`s The Kiss, almost in a similar manner in the 1,200m Philippines Cup, that, too, was claimed by Habbu`s charge Arashi (Shezad Khan). It was a mere coincidence that the 8/10 hot favourite, The Kiss, was asked to gallop from the wrong end of the 14-horse field and lost the race by a nose. The filly had scored in a similar manner in her earlier start. However, Sandesh`s hard riding of Point To Prove, in the 2,000m Malaysia Cup save the day. Taken to the front from the start, the Multidimensional son just about managed to spoil Habbu`s another gamble on Raise A Grand (Shehzad) who was seeking a hat-trick of wins. 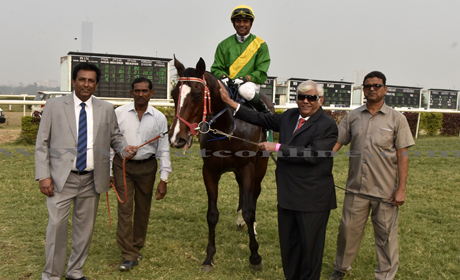 Sandesh was, however, brilliant on Javed`s long shot, Sanvi, in the 1,400m French Cup. The five-year-old had been a very disapproving performer, since her first two seasons. 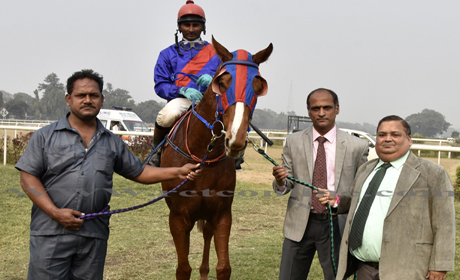 She was also given a waiting race but gained the ground with an electrifying run in the home stretch to beat another friendless runner, Respect (Ajeet Kumar), from Shafiq Khan`s stable, and a fancied pair, Summerhill (Suraj) and Bojangles (Zervan) who made the running till about the distance-post. Trainer James McKeown`s Viareggio (Hindu Singh) attracted pots of money in the 1,100m Portugal Cup but the Excellent Art son never lived to the expectations, galloping in the mid-division all through while the two speedsters – trainer Vikash Jaiswal`s Buddyholly (P.S. Chauhan) and Deepak Karki (app. Sujit Paswan) went at a scorching pace up-front. In the end, it was the 7/2 shot Buddyholly, who made ample amends for his last failure.